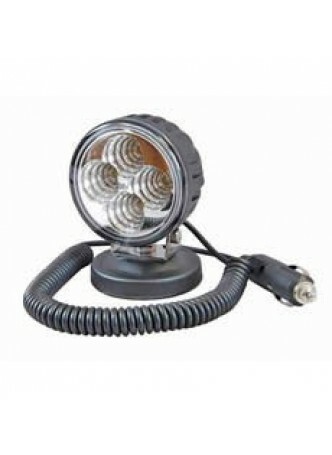 A powerful 4 x 3 watt 12/24 volt LED work lamp. Low current draw, 1 amp at 12 volt dc. Black powder coated die cast aluminium case, polycarbonate lens, supplied with stainless steel adjustable bracket, magnetic base and 2.5 metre working length retractable cable with a cigarette lighter plug. 900 Lumens. Protected to IP67. L 83mm x W 78mm x H 116mm.